This article explains how to correct the problem in BACKTRACK when the report lines or rows have too much information, but you still want to expand them to view them. 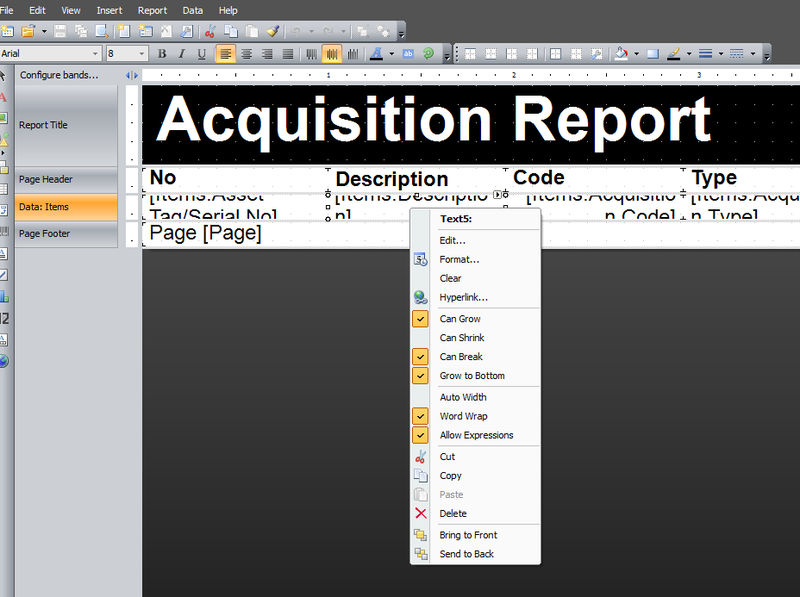 User tried to expand the report to accommodate long item description (by having it expand to the next line). We are assuming that the user wants to display the full description (or other field) that is too long for the space allocated on the report. In the report writer for BACKTRACK 2012 and after, the field can automatically expand to the next line. To confirm the requisite settings, select the field, right click, make sure that Can Grow, Can Break and Grow to Bottom are checked. Every band and report object has these properties. They determine whether an object can grow or shrink depending on the size of its contents. If both properties are disabled, the object always has the size specified in the designer. Every report object has this property. When printing an object with this property, it stretches up to the bottom edge of a band: This is needed when printing information in a table form. In a table row there can be several objects which can stretch. This property makes it possible to set all objects’ height to the maximum height of the band.